We've heard stories in the past about petrol pumps going up in flames on people due to people smoking or using their phones (possible urban myth), but to see an instance of it actually occurring is terrifying. 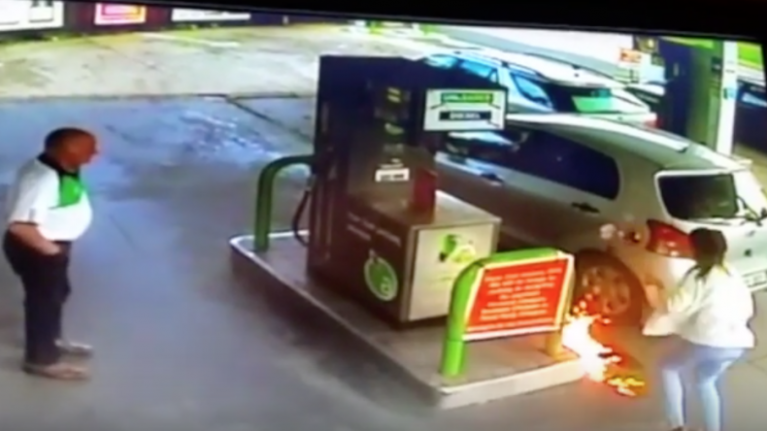 Éilis Keegan from Athboy, Meath was filling her car with petrol at a station in Leitrim on Saturday when the nozzle she was using suddenly caught fire and spread into the fuel cap. She immediately pulled the nozzle from the car and ran to get help inside the store where one of the workers produced a fire extinguisher to put out the flames. The footage is scary and when you consider how terrible this could have ended, Éilis was quite fortunate to escape with just some singed hair and eyebrows. Speaking to JOE, Éilis said: "Some people presumed I had been smoking or on my phone while using the petrol pumps and therefore was responsible for the fire, however that was not the case. "I was completely baffled as to how the fire had started as my phone wasn’t even in my pocket and I could see no explanation for a fire. "The staff of the shop, who looked after me really well – as I was obviously in shock after the incident – rang a mechanic who came out to take a look at the car and the pump. There was no damage to either. "He said that he had never seen the likes of it before but thought it must have been caused either by the friction of the petrol pump nozzle and the tank outlet, or the static electricity from me or my clothes. "He asked me if I ever get an electric shock from car doors and when I said that I do all the time he said that the latter was the most likely explanation. He also said that the chances of that happening were one in a million." Had the tank not been full at the time, the whole car could have gone up in flames and then potentially the entire petrol station. She has now bought an earthing strap for the car but still won't be getting out to fill petrol again anytime soon.